We have all heard that apple cider vinegar is the cure for just about anything. But is it really? And if it is, does it really work to use on my pet like we hear so many talks about? Well, we are here to clear that up for you! Yes, absolutely, Apple Cider Vinegar can be used in many different ways for your pets and their needs. Caution: Prior to using apple cider vinegar to clean your dog’s ears, it is important to make sure that the inside of the ear is not raw. Combine 2 to 3 tablespoons of apple cider vinegar to 1 quart of water to make a post-bath rinse. Bathe your dog as usual and, after thoroughly rinsing the shampoo from your dog’s coat, pour the ACV mixture over your dog, carefully avoiding his eyes. Do not rinse; towel dry your dog until damp and then let dry naturally. Another option is misting diluted or undiluted ACV onto your dog’s fur immediately before brushing to help give his coat a beautiful, healthy shine. Mix two parts water and one part apple cider vinegar in a large bowl or bathtub. Soak the irritated paws for up to five minutes each. Don’t rinse, but do ensure you thoroughly dry your dog’s paws after soaking. Repelling fleas, ticks and other biting insects with ACV can be done in several ways: with a sponge bath, a mist, or by mixing ACV into your dog’s food or water. Bathe your dog, as usual, rinsing his coat and applying an ACV mixture while he’s still wet. Combine one part water to one part ACV in a medium bucket or container. Dampen and squeeze out a large sponge, then dunk the sponge in the ACV mixture to absorb the fluid. Sponge the mixture onto your dog’s coat, dunking the sponge as needed to absorb more of the mixture. Make sure the coat is soaked all the way to his skin, then allow the fur to air-dry. Mix one part water with one part ACV in a clean spray bottle. Spray a fine mist of the mixture onto your dog’s coat before he head’s outside. 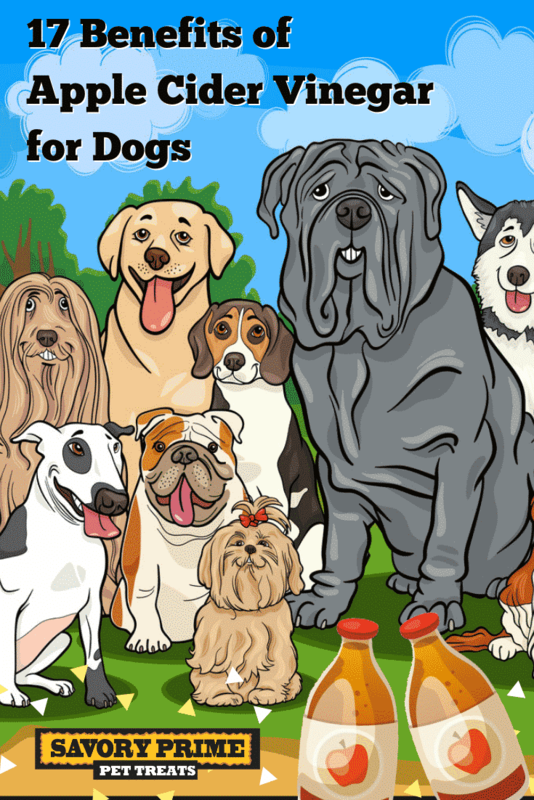 Be careful not to spray the mixture into your dog’s eyes or nose. Add a daily dose of ACV to your dog’s food or drinking water. Use the recommended daily dosage of ACV, which is 1 teaspoon to 1 tablespoon per 50 pounds of your dog’s body weight. Start with a lower amount and increase if needed. Add the dose to your dog’s drinking water or food once each day, mixing it well into water, wet food or coating the kibble. If adding to drinking water, make sure plain water is also available to prevent possible dehydration in case your dog ends up drinking less water due to the vinegar additive. Mix one part water to one part ACV in a medium bowl or container. Dip a sponge or cotton ball into the mixture, ensuring it’s fully saturated. Sponge or dab the mixture onto the affected area on your dog. Reapply daily as needed until the affected area has shown improvement. Never apply ACV to open wounds or extremely raw skin. Applying warm ACV to the dog’s joints can help alleviate arthritis pain while adding ACV to your dog’s food or water can help break down calcium deposits that form around older dog’s joints. Warm a small portion of undiluted ACV in the microwave. Soak a compress washed cloth in the mixture until saturated. Apply the compress directly to the dog’s joints. Use the recommended dose of 1 teaspoon to 1 tablespoon of ACV per 50 pounds of body weight. Add the recommended dose of ACV to your dog’s food or water twice per week. Continue use to help joints become less painful and more flexible. Have plain drinking water available as an alternative if adding ACV to water. Dogs may drink less water if ACV is added, and having plain water available reduces the possibility of dehydration. Add the recommended dose of 1 teaspoon to 1 tablespoon per 50 pounds of body weight to your dog’s food or drinking water daily. Mix the ACV directly into the food or water, or pour on top of wet food or kibble. Provide plain drinking water as an option if adding ACV to the water bowl in case your dog drinks less water due to the ACV. Drinking less can possibly result in dehydration. Create a mixture of one part water to one part ACV in a medium container or bowl. Saturate a sponge or compress with the mixture. Apply the mixture to the affected muscles, gently massaging it into afflicted areas. Repeat daily as needed until your dog shows improvement. Measure out 1 teaspoon to 1 tablespoon of ACV per 50 pounds of your dog’s body weight. Add a daily dose of ACV to water bowl or pour over food. If using ACV in water, make sure plain water is also available in case your dog decreases his water intake due to the addition of ACV. Bathe your dog, as usual, rinsing well. Pour undiluted ACV directly onto your dog’s fur. Thoroughly distribute ACV throughout the fur by massaging lightly with a dog grooming glove. Rinse well once again to remove all traces of ACV. Mix a portion of ACV into your dog’s food or water, using 1 teaspoon to 1 tablespoon of ACV per 50 pounds of body weight. Stir ACV into water, kibble or pour directly over food once each day. Provide a dish of plain water if adding ACV to your dog’s water dish in case he drinks less, which can lead to a risk of dehydration. 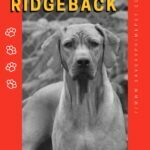 Have your dog stand in a tub, sink or other location that can get wet. Pour undiluted ACV over the affected area. Gently pat off excess moisture with a towel; let the area dry naturally. Repeated as needed daily until the issue is resolved. Mix the suggested portion of ACV into your dog’s food or water bowl daily. Add the ACV directly to your dog’s water dish or sprinkle over or mix with food. Provide an alternate water dish without ACV when mixing with water in case your dog drinks less due to the addition of ACV in the other dish. Add a small amount of ACV to your dog’s drinking water over the course of several weeks. Start with about one-quarter of a capful, working up a full teaspoon over the course of several days. Change the water daily, adding fresh ACV to each fresh batch of water. Make sure you provide a bowl of drinking water without ACV just in case your dog drinks less of the AVC mixture due to the taste. Gradually increasing the amount of ACV, however, should help him get used to the taste. Start with a clean, empty spray bottle. Fill the bottle with a mixture consisting of equal parts water and ACV, and 10 drops of cedar oil. Spray the mixture on your dog’s fur, taking care to avoid the head an eye area. Spray the mixture on other locations to eliminate flies, such as barns, patios, picnic areas and yards. While we covered a multitude of ailments and health issues that can be helped with ACV, there’s no way we covered them all. Apple cider vinegar is just too comprehensively powerful to provide an absolute end-all list of issues it can help! Follow the instructions for an ACV sponge bath for external issues. Add ACV to your dog’s food or water for internal issues. Detailed instructions for both the sponge bath and internal treatment can be found in the flea and tick section. Healthy pets generally have a pH of 6.5 to 7, something you can test through urinalysis or with pH strips available at many drug stores. If pH levels are too acidic or too alkaline, bacteria is more prone to thrive, potentially causing health issues down the line. Although ACV typically has an acidic pH somewhere between 4.25 and 5, it can help balance pH levels either upward or downward as needed. Apple cider vinegar has both acidic and alkaline properties. While the vinegar itself is acidic, the apples used to create the ACV are alkaline. Vinegar and other food items undergo oxidation in the body’s digestive system. The oxidation process actually alters the vinegar to alkaline, since alkaline was the natural state of the apples before they were transformed into vinegar. 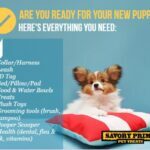 Apple cider vinegar can thus give your dog the best of both options, boosting a low pH or lowering a high one as needed in his body. Apple cider vinegar comes from apple cider that has been fermented. The fermentation process involves the breakdown of the cider’s sugars by yeast and bacteria. The yeast and bacteria first turn the sugars into alcohol and, if fermentation continues, the alcohol turns into vinegar. Apple cider vinegar has a light yellow-brown color. Unpasteurized and unfiltered ACV contains a dark, cloudy sediment known as the “mother.” While the “mother” may not look particularly appetizing, it is where all the beneficial living bacteria and nutrients reside. Clear vinegar has been processed and distilled, giving it a clean, pure look. That processing and distilling, however, strips all the beneficial components out of the vinegar. Apple cider vinegar has a very strong and distinct taste. When incorporating it into your dog’s food or water, you want to do so gradually and in small amounts, so your pet can adjust to this taste. 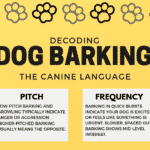 Some dog owners find it better to combine ACV with their dog’s food as it helps to mask this distinct taste while others find adding it to water actually encourages their dog to drink. 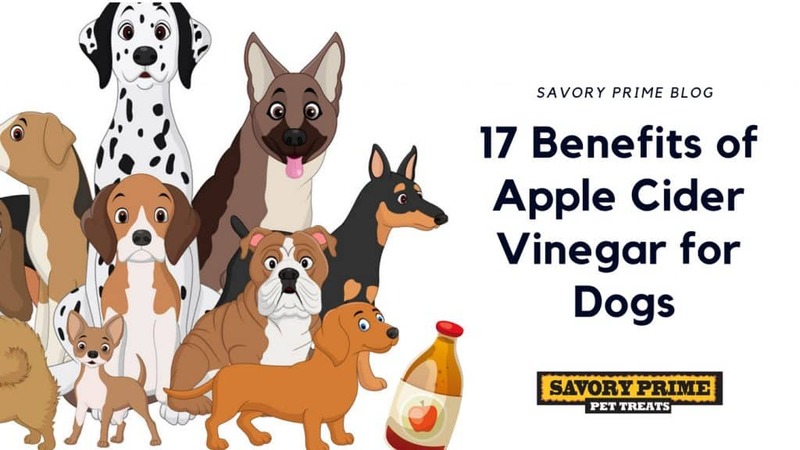 While many dog owners, vets, and holistic pet care providers swear by apple cider vinegar, the benefits of apple cider vinegar for dogs are not well studied. Because most of the claims are based on testimonials or personal experiences, not everyone agrees that ACV should be used as a canine supplement. If your dog suffers from an existing health condition, is taking a daily medication or if you are simply unsure whether or not your dog could benefit from apple cider vinegar, contact your local holistic veterinarian. Your holistic veterinarian can also provide you with more precise dosage information based on your dog’s weight, along with ensuring you’re using the right type and strength of ACV. Your choice should be naturally fermented, unpasteurized, unfiltered, and organic.